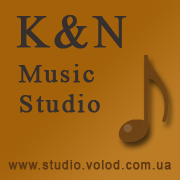 K&N Music Studio means: 'Kurylenko & Nyzhnyk Music Studio'. It is founded by two Ukrainian Musicians Volodymyr Kurylenko and Artem Nyzhnyk in 2009. Writing music for movies, documentaries, shows etc. Each order is individual. We will negotiate the best conditions for you!